Alyson Smith shows a colorful piece of wonderstone she collected near the Wonderstone Quarry in the Vernon hills. An outcropping of rock in the Vernon hills has spots were rockhounds find the colorful wonderstone. 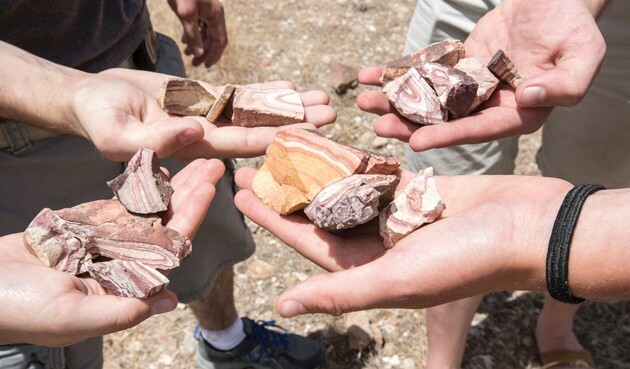 Amateur rockhounds show the small pieces of wonderstone they collected near the Wonderstone Quarry in the Vernon Hills. 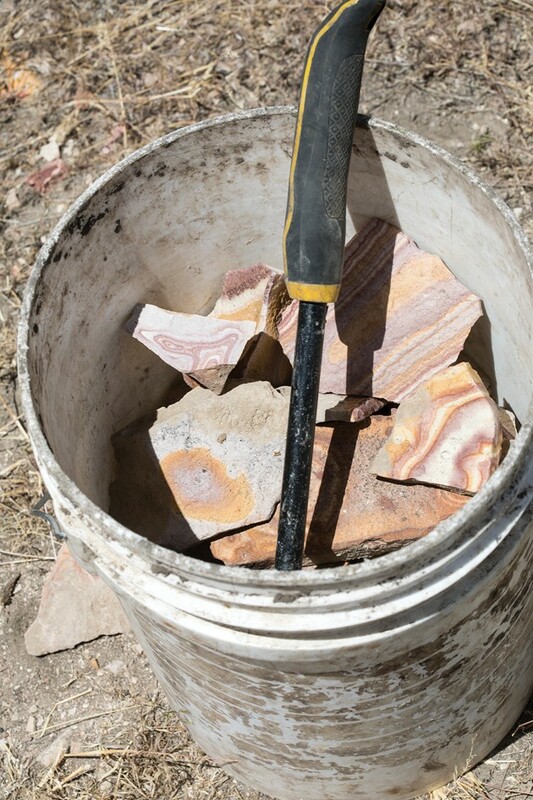 A five-gallon bucket is filled with pieces of wonderstone collected by an experienced rockhound who visits Tooele County to look for pieces to give to friends and family. The colorful rings of the wonderstone make it desirable to area rockhounds. Vernon has long been a hotspot for recreationalists. The town is perhaps best known for its 20-acre reservoir or as a way station within the massive Prospector OHV trail system established in 2015. Its historic diner/convenience store, Silver Sage Emporium, serves thousands of visitors each year. However, its greatest treasure may also be the least obvious: the rocks and minerals found in its surrounding countryside. Will Walston has been rockhounding in Tooele County since the 1980s. Over the last 30 years, he has collected thousands of specimens from public lands. A familiar face to the employees at the Silver Sage, he can be found hiking around Vernon and the historic Pony Express trail almost every weekend. First and foremost, it’s the history he learns while rock collecting that draws Walston in. 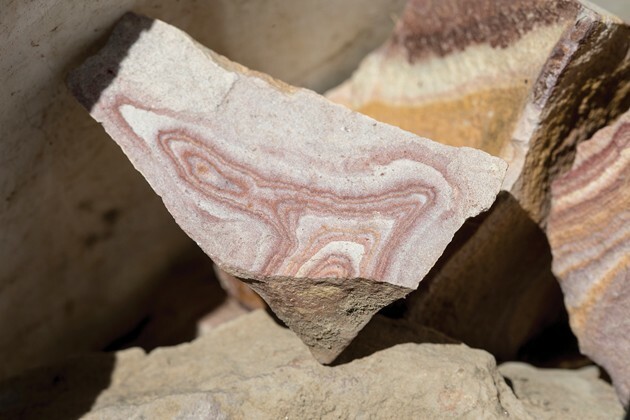 Many rockhounds who visit Vernon come looking for the Dugway Geode Beds, located near Simpson Springs. However, there is a lot more than geodes out there for people to find, Walston said. Not far from Vernon, at the end of a well-kept dirt road, is a cache of wonderstone. 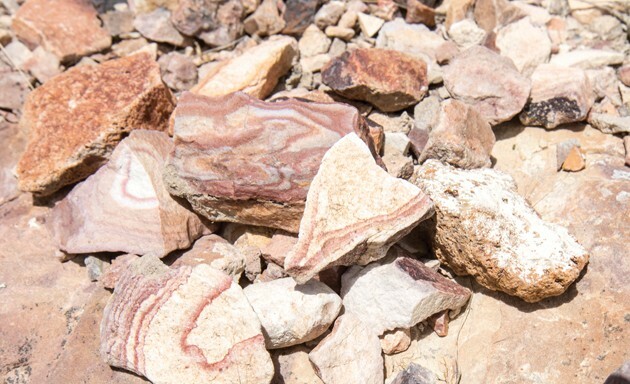 According to the Utah Geological Survey, wonderstone is known for its colorful, intricate designs. It is formed when particles of volcanic glass are welded together by heat and then compressed by the weight of surrounding rock. Circulating groundwater, combined with the presence of iron oxides, create swirling bands of color. As pretty as it is, wonderstone doesn’t make good jewelry because the rock is too soft. But it’s still beautiful to look at and fun to collect, said Donna Chavez, president of the Tooele Gem and Mineral Society. 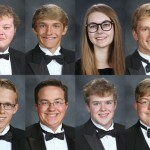 Members of the Tooele Gem and Mineral Society like wonderstone because it adds variety to the souvenir “grab bags” they put together for their annual rock show. In addition, although the stone is too soft to make into jewelry, it can be used in other ways. However, amateur rockhound Alyson Hill wasn’t thinking of clocks when she came to Vernon looking for wonderstone. She was mainly interested in the adventure. Hill, a college junior from Vancouver, Washington, loves the outdoors. She and her friends try to “do something adventuresome” every weekend. “This was our adventure this weekend,” she said. 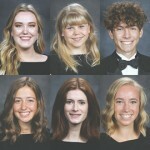 Normally, Hill and her friends look for places to hike or explore near Utah State University, where they attend school. But this time, the wonderstone drew them to Tooele County. 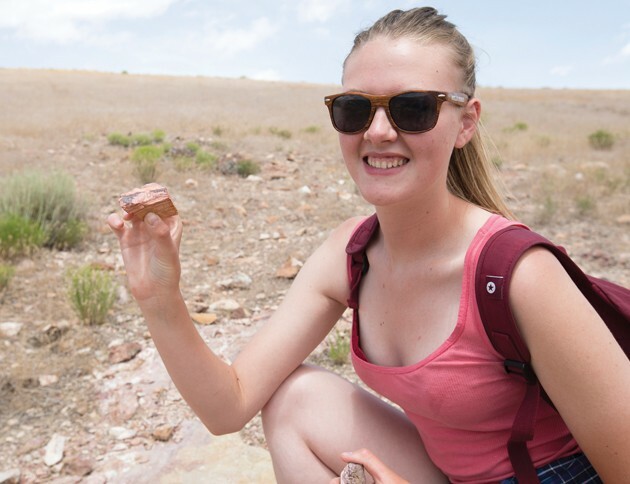 “I like rock hunting and stuff like this because I can get free souvenirs,” she said. For Hill, the rocks she collected aren’t just souvenirs. They also represent something equally valuable ­­— a memory. While rockhounding can be a fun, free activity, Walston cautioned anyone who wants to go exploring to plan their trip carefully. “What I do is I plan where I want to go, and how long I want to stay,” he said. Walston advised people who aren’t familiar with the territory they plan to explore to look at a map of the area beforehand and at least learn the basic landmarks. 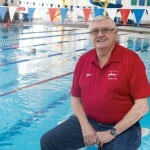 “I basically try to encourage them to get out and pay attention to safety issues and the rules and regulations and basically just have at it,” he said. Rules and regulations differ depending on who owns the land people are exploring. The collection of rocks, minerals, and invertebrate fossils for non-commercial purposes is also allowed on land owned by the U.S. Forest Service, according to the USFS. However, a rockhounding permit is required for people wanting to explore state land, and people should obtain permission before entering private land. Rockhounding is also forbidden on marked mining claims and “rock piles showing signs of recent mining activity,” the Utah Geological Survey’s website states. When people find a good collecting site, they should be courteous and not take more rocks than they can use, Chavez added. 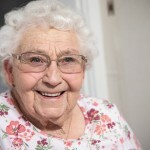 “You want to collect what you can use and leave some for somebody else to use,” she said. 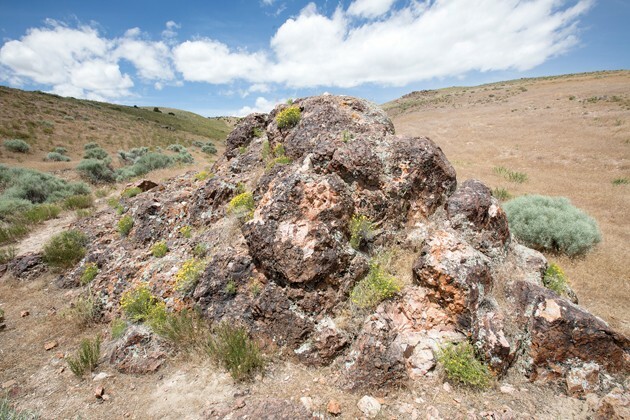 The wonderstone collection site is located on BLM land. To find the site, travel south on state Route 36 approximately 4.5 miles past Vernon. Turn left on the dirt road located just before the railroad tracks and keep right at the fork. The road ends just before the wonderstone cache. The Utah Geological Survey recommends driving a four-wheel-drive vehicle, as the road to the site can get muddy. This year, the Tooele Gem and Mineral Society Rock Show will take place September 22-24 at the Dow James building, in Tooele City.